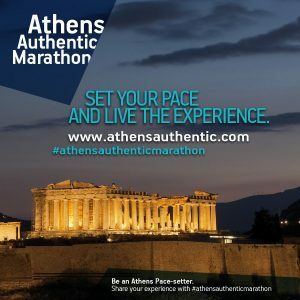 This year the “Athens Authentic Marathon” goes with the motto “set your own pace and live the experience “. An undoubtedly amazing experience for all athletes or non athletes, as it is an event with 122 years of history that can take you to a trip back in Ancient Greece. According to the legend, it covers the same ground that the Athenian messenger Pheidippides ran to bring the news of victory from the battle of Marathon 2,500 years ago. The finish line is in Athens’ Olympic Stadium, the birthplace of the modern Olympic Games in 1896 . The Athens Authentic Marathon is recognized as the original Marathon course and it is the same course used in the 2004 Olympics held in Athens. The Authentic course is 42.195 km but there is an option for 5km or 10km so everyone can take part in it regardless of age and physical state. The Marathon is a respectable sport event not only because of it’s origin but also because it tests the strength , the will-power and the endurance of the runners. It puts them through a process of re-evaluating themselves . The point is not the finish line but the journey . The Authentic Marathon is a lifetime experience suggested for everyone to try once in their life. Apart from it’s sports and Athletic character , the Marathon has more to offer as it is a significant cultural and social event . Every year it gathers thousands of people from all over the world and is a celebration for the whole Athens city. Even if you don’t want to run, it is worth visiting Athens during the Marathon days because you can enjoy many daytime and nighttime activities as well as festivities and exclusive tours and exhibitions. The Marathon Event lasts 4 days, having various exhibitions as part of it , a welcome reception , the flame lighting ceremony ,the actual race and a farewell ceremony . The 2018 Athens Authentic Marathon will be held on 11 November 2018 and runners from all over the world are showing intensive interest in being here and experiencing its magic. the “Athens Authentic Marathon” is a great opportunity to experience the Ancient Greek Tradition, Culture and History! For another year, Attalos Hotel is certified as a ’’ Marathon Hotel ‘’ and supports the runners by offering special treatment in this ultimate challenge. Maps and all kinds of information about the Marathon and the routes will be available at our 24h Reception Desk. Breakfast will be served at 05:00 on the Marathon Day and each runner will get a bottle of water to have with them to be ready for the Marathon. Last but not least, look for the “Athens Spotlighted cards” that offer a handful of services and discounts for museums, shopping and entertainment. Share your experience with the hashtag #athensauthentic . Let’s all become a bid family and promote unity , friendship , culture and humanity and environmental values. We wish Good Luck to all the Marathon Runners!